Dave and I have just returned from Southern Italy where we took an unscheduled holiday. Even though the trip was well planned, we do not normally go away at this time of the year. In January, the night before I left for Johannesburg, Dave asked me if I wanted to go away in September. I told him that it was too close to our return from Italy in June and so we chose to look for something in October. Dave has always wanted to go to the South of Italy, and as we were fulfilling my wish of seeing Venice in May I could not say no. As is our habit, we end the day off with a drink in a local bar. After our trip to Venice Dave decided he loves Prosecco and so each night we headed into the old city of Tropea to have a glass each. In Southern Italy our drinks came with snacks – the cost was €2 more than in Venice but there we only got served the alcohol. The snacks were very substantial and I have used that as my inspiration for the sundowner snacks I am entering into the Simple Snacking Challenge being hosted by Two Oceans Wines. The first component needs no cooking and therefore no recipe. The region we were in has the largest olive groves I have ever seen and one plantation was bigger than any local olive farm. Each night we were served a bowl of green olives, picked off the local trees and cured. They were served plain and simple and were perfect with the dry Prosecco. Together with the olives I made roasted chickpeas which are better than any plain nut you could have placed onto the platter. I then made some mini pizzas served exactly as we had them in Tropea, plain pizza dough topped with pizza sauce. Last, but not least, I served my wine with a slate full of sweet potato crisps. These were so tasty that I made a second batch straight away and I have put them away to save for another day. 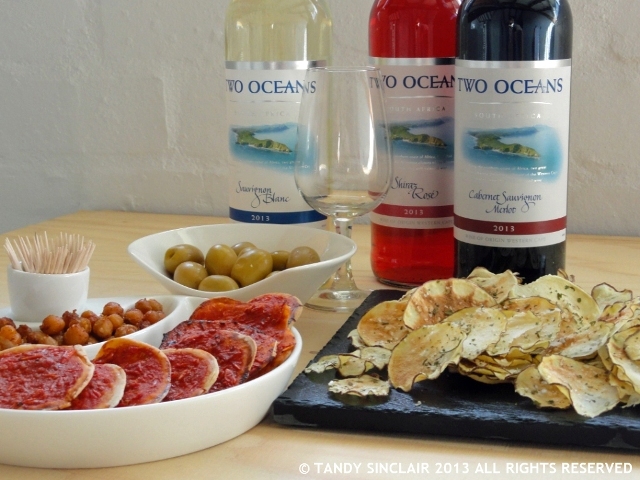 Disclosure: I was sent Two Oceans Wine to take part in the Simple Snacking challenge. This post will form part of my entry. This post is in line with my blogging policy. For this challenge we were given a budget of R100 to spend to make our snacks. Without costing the seasonings I used I spent R52.88. As I side note, if I had served the second batch of crisps my cost would have increased to R56.30. It shows you how easy it is to make cheap snacks. Yummy ! It is something different. Moreover, it looks delicious. Thanks for this recipe. It seems to be time saving recipe. They are delicious, and go well with a wee dram! I love these, Tandy and your pic is beautiful!!! All these snacks look really delicious. I love sweet potatoes, and these chips would certainly go down very well. I love microwave chips, but never thought to make a sweet potato version! These sound divine Tandy! And I’m so glad you’ve had a couple of good holidays this year! Celia, you could make these crisps with anything from your garden! These crisps look delicious! What a great little appetizer spread! Somehow I missed the post on the sweet potato crisper. What a terrific invention! Putting it on my holiday list. It is just the best invention ever! I love the tapas concept – though generally I’d prefer to have the option of a cheaper drink without the snack! We never asked for the option without the snack, but I imagine it would have cost less! Love the idea of the sweet potato crisps, how delicious. I don’t have a microwave but these look so good I am tempted to try them out at a friends’ house! These are fantastic, and worth using a microwave for! What a great healthy snack, Tandy! It was amazing – where is your dad from? Yay for homemade sweet potato chips! Yum. Oh I like Prosecco as well 🙂 Nice snacks to go with it. Love your recipe for a healthy snack, Tandy, thanks for sharing the recipe. I make my own crisps but I normally deep fry them, not so healthy I know. Your microwave chip maker seems familiar to me: I bought one as a pizza plate to bake pizza on a gas barbecue. That’s a clever marketing idea, no? Have you ever tried making crisps in the oven? I love not planning so much in advance for a getaway. Looks like you guys had a great time!